click photo to enlarge For Christmas I got Karen a Glider package from Warner Springs Ranch. 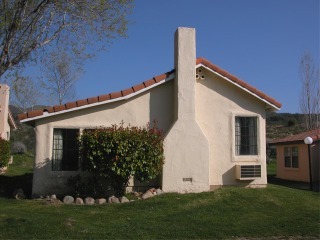 It included one nights stay at the Ranch and a glider ride. This was our room. The rooms were more like a small apartment. It included a bedroom and sitting room. It also had a wonderful fireplace. click photo to enlarge They have 2 Olympic sized pools. 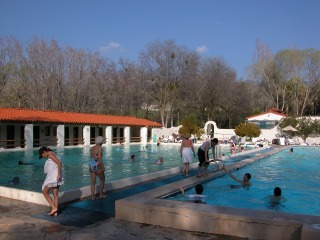 The one on the left is a hot mineral pool. It is fed by water from a hot mineral spring. They cool it to between 100 and 104 degrees F. Then they use a heat exchanger to warm the normal water in the pool next to it to about 85 degrees. We spent about an hour in the pool at night. It was a cool crisp night about 50 degrees and the hot pool was wonderful. Then went back to the room to enjoy the fireplace. 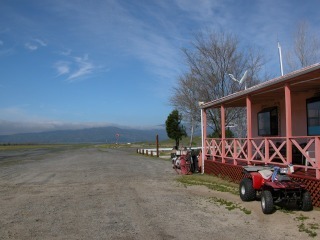 click photo to enlarge This is the Warner Springs Airport. 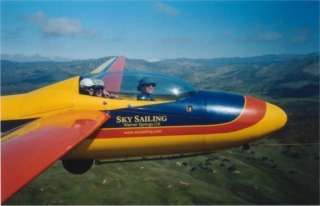 We had a great day for a glider ride. click photo to enlarge There was a camera mounted on the wing of the glider and the pilot took pictures of us with a remote control. It is a really neat experience I highly recommend it! 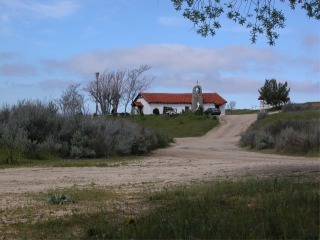 click photo to enlarge This old Mission built in 1830 was also on the property of the ranch. We enjoyed our stay very much. The Warner Springs Ranch and Spa made for e very nice weekend.